A new group called "Reform Immigration For America" recently launched in order to push for comprehensive immigration reform, aka amnesty. They're a coalition of business, labor, and far-left/racial power groups; see their slick site here: reformimmigrationforamerica.org. A surprising variety of amnesty hacks this side of raving extremist (or thereabouts) is involved with their organization; see  and . On this video, new U.S. Congressman John Quigley - replacement for Rahm Emanuel - introduces the Illinois version; more on him at  and . Today several marches were held in various cities , however the more important events are to come. On Wednesday they'll be holding a press conference in Washington DC featuring those listed at . A "national summit" involving "700 grassroots advocates" will be held Wednesday through Friday, and on Thursday they'll be holding a "National Town Hall Meeting". As they mention, Barack Obama will be holding a meeting with Congressmembers next Monday on the same topic. Their "Principles of Immigration Reform" show just how much they're attempting to mislead people. They say, "Opponents of reform try to pit the needs of native-born workers against immigrants, but our vision of reform is that a rising tide lifts all boats." Their "vision" fails to take the realities of the market into account; see immigration wage floor. 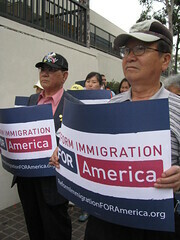 Comprehensive immigration reform would recommit our country to being both a nation of immigrants and a nation of laws. Unless we reform the broken immigration system as a whole, we will fail to solve the problems at hand. The necessary components of reform include: (1) improving the economic situation of all workers in the United States; (2) legalizing the status of undocumented immigrants working and living in the United States; (3) reforming visa programs to keep families together, protecting workers’ rights, and ensuring that future immigration is regulated and controlled rather than illegal and chaotic; (4) implementing smart, effective enforcement measures targeted at the worst violators of immigration and labor laws; (5) prioritizing immigrant integration into our communities and country; and (6) respecting the due process rights of all in the United States. One of the sops "reform" supporters have thrown out is a promised increase in enforcement, but it's rarely been defined in such a limited fashion. Under their definition, most employers could hire illegal aliens at will. While (hopefully) many would consider the 9000 child labor law violations in regards to the Postville case very bad, yet many far-lefties have worked to defend Agriprocessors and that city. As for #5, I'm sure the National Council of La Raza and their ethnic nationalist friends would be more than willing to help with assimilation. And, while they cover it later on, something entirely missing from their definition of CIR is anything related to border security. They also want to "over time to develop long-term strategies that improve the economic conditions in regions that supply large numbers of economic migrants". At the same time, the legalization they support would give those countries a great incentive to keep sending us people. The correct way to reform those sending countries is by forcing them to deal with their own people by encouraging their citizens who are here now to return home and by discouraging those countries from sending us more people; RIFA is going the other way. They want a "registration program that includes reasonable submission to background checks, paying an appropriate fine, paying taxes, and studying English". One wonders just how sloppy those background checks would be; they probably don't have the current FBI background checks in mind. And, does anyone expect those who are currently giving a wink and a nod to massive illegal activity to not give a wink and a node to the other three? Note also that "studying English" is not the same thing as, say, demonstrating proficiency. Expect a lot of people to be "studying". Their section "Protect U.S. and immigrant workers" makes the false claim that being able to join a union will "ensure that immigration policies do not depress wages", completely ignoring market forces: more workers means lower wages. They do briefly acknowledge systems like eVerify, so they aren't completely opposed to such systems. The only question is how they'd try to monkeywrench the use of such systems. They say we have a "highly integrated North American labor market" and propose an "independent commission that can assess labor shortages and determine the number and characteristics of foreign workers to be admitted, with Congress' approval". One wonders why they need such a commission, considering that they seem to think that the number of workers has no bearing on their wages. A sensible enforcement strategy will keep America safe, protect due process and human rights, make the most effective use of the tools and policies already available in a fair and reasonable manner, and be fiscally responsible. Such a strategy would prioritize enforcement actions to target genuine threats, including the prosecution and removal of violent individuals who pose a threat to public safety; the prosecution of unscrupulous employers who are exploiting vulnerable workers to enhance their competitive advantage; the elimination of trafficking and drug smuggling operations that profit from human exploitation; and the prevention of exploitation of the immigration system by those who seek to do the country harm. This strategy, however, must be coupled with vigorous enforcement of civil rights and labor and employment laws. While the use of detention may be necessary in some cases, it should be used as a last resort, and Congress and the Administration must ensure that all detainees are treated safely and humanely by mandating the creation of enforceable detention standards. An effective and sensible immigration enforcement strategy should not include continued use of local law enforcement agencies to enforce federal immigration law, indiscriminate worksite and neighborhood immigration raids, and blanket detention policies. Under that proposal, every ICE agent would practically have to seek the approval of an ACLU lawyer before doing anything. While a discussion of border issues is missing from their summary, it does appear later on, and it's just as weak as the last quote. They also want a "Border Enforcement Review Commission" to "ensure that the rights of border residents and immigrants are protected and that enforcement measures are fiscally responsible". Pretty much anyone should realize what that means: the Commission would meddle in any action that sought to prevent future illegal immigration and attempt to tie the hands of the Border Patrol every chance they got. Some members of the Commission would probably be linked to the Mexican government or at least be Mexican partisans. The events are listed at reformimmigrationforamerica.org/blog/take-action/local-campaign-launches . Some of those listed include Julien Ross of the Colorado Immigrant Rights Coalition; the Georgia Association of Latino Elected Officials, one of whose founding members is involved with a bank catering to Hispanics and another which may have been drawing a salary thanks to the Mexican government; the Illinois Coalition for Immigrant and Refugee Rights, whose president is linked to that government; ACORN founder Wade Rathke; the Massachusetts Immigration and Refugee Advocacy Coalition; Casa de Maryland; the American Immigration Lawyers Association; Make the Road of New York; New York Immigration Coalition; League of United Latin American Citizens; Border Network for Human Rights; and Voces de la Frontera. I guess it's kind of like we have to (demographically) destroy America in order to save it. And a killer foto too -- if that's not enough to disgust you than I don't know what is. look within 40 years Red China and its people will own this place and our little brown and black brothers will all be enslaved by the chinese Reds. and that will be total justice. Mary i just want some happy time before being shot!